A new Dublin exhibition honours the 796 Tuam Babies, and their families and survivors. Donal O’Keeffe attended last week’s launch. then laid in a tomb. a septic tank in Tuam. “As a journalist I have always tried to keep the story of the Tuam Babies in the public domain,” says Alison O’Reilly, with characteristic understatement. In fact she is the person who broke the Tuam Babies story – nationally and internationally – in the Irish Mail on Sunday on May 25, 2014. O’Reilly says the Tuam story shines a light on all children who died in institutions across the country. 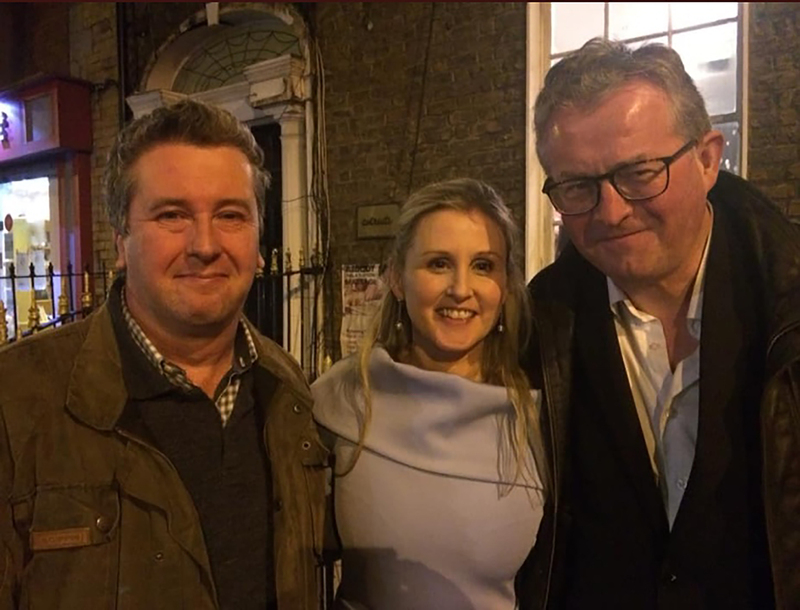 Philip Boucher-Hayes, Alison O’Reilly and Donal O’Keeffe. The Tuam home operated from 1925 to 1961 and was run by the Bon Secours Sisters. It was one of a number of institutions for unmarried mothers and their children across Ireland, operated by religious orders. I have written here before of the search by Anna Corrigan for her brothers William Joseph and John Desmond Dolan, missing from the Tuam Home, and Catherine Corless’s research into the 796 children who died at the Home, for whom no burial records exist. The Tuam site is to be excavated later this year in a bid to recover the remains of hundreds of babies believed to be buried in a disused sewerage system. It is feared that some, or all, of the 796 children who died in the home were buried in the mass grave without proper funerals. Some relatives, like Anna Corrigan, believe some of the Tuam Babies may have survived, their death certificates falsified, and may have been sold for adoption abroad. Alison O’Reilly’s reporting sparked an international outrage, and became a focal point for all of the lives blighted by Ireland’s bleak legacy of misogyny, neglect, and forced adoption. Now, at a time when Anna Corrigan and other relatives and survivors have expressed strong misgivings about the Mother and Baby Homes Commission of Investigation, which has been granted an extension of one year before publishing its final report, O’Reilly is keeping the story of the Tuam Babies in the public eye in a new way. It was the work of Alison Lowry, the artist who created stunning glass sculptures depicting the Tuam home pinafores, and the Belgian artist Martine Sterck’s sculpture The Chalice of the Defenseless Children which was gifted to Catherine Corless, which first made O’Reilly think about a display of artwork inspired by the Tuam Babies. “I was then invited to the vigil last year, where Barbara O’Meara and Karen Ward carried out a stunning healing ceremony on the grave in Tuam with the Stitched with Love Community who, with the help of 300 men and women all over the world, had knitted 800 squares of a baby blanket. I knew then that these artworks should be exhibited under one roof. I contacted a number of galleries for help, but Dino Notaro from the In-Spire Galerie on Gardiner Street was the only person who responded to me. RTÉ’s Philip Boucher-Hayes, a journalist who, from the beginning, did everything he could to further the Tuam story, launched the exhibition, and spoke of the power of art in helping us to address tragedy. “Good art brings a new layer of meaning to the world around us,” he told me after the launch. “I reported from Iraq in 2003, and I thought I knew everything there was to know about that war. But several years later I read the poetry of Brian Turner and listened to Springsteen’s Devils and Dust a hundred times over, and it brought whole new layers of understanding. The In-Spire Galerie was packed on opening night, and Alison O’Reilly says there has been a lot of interest in taking the exhibition around the country, something she says is being considered: “The work at the gallery is so powerful it would be a waste not to try and show it to as many people as possible. “The Tuam Babies were children in the care of the State and religious orders. They should have been cared for better. The Bon Secours nuns were nursing nuns. So what went wrong, and why did so many children die in their care? Who nursed them when they were dying? Who sat by their beds and cots and comforted them on their way to the next life? Was it their mother? Was it a nun? Was it anyone? When the State takes a child into care, the State is saying ‘We can do a better job than your parent or carer’. That did not happen in Tuam. “Reports show that up to 10 children died in one month in some of the years the home was in operation. 10 children a month. That is a stark figure. That was not normal then and it certainly isn’t normal now. Who buried these children? Who thought it was okay to put them into a defunct sewerage system after they died? Who decided to leave them there when the nuns left Tuam? The nuns who died in Tuam were buried on the grounds of the plush Grove hospital, which the Bon Secours also owned. Who decided, when the nuns left Tuam in the early 2000’s, that they should exhume 12 of their colleagues and bury them in Knock, and who decided to leave the 796 children behind? O’Reilly’s passion for the Tuam Babies is undimmed, almost five years since first she told the world their story. “It is worth noting, that despite any previous reports about how the children were buried, the former State Pathologist Dr Marie Cassidy who carried out an inspection at the Tuam site during the test excavations in 2016, wrote a report on 5th October that year saying the children’s remains were in a ‘haphazard arrangement with no evidence of being en-coffined or shrouded’. That’s the line that has deeply affected me most of all. I’m sure there were children buried in coffins on the grounds in the latter years. That’s the testimony of some locals in Tuam, but Dr Marie Cassidy’s report brings it home to me. Who thought this was okay to bury children in such an undignified manner in a sewerage pit? “Just to remind the non-believers, the archaeologists who found the ‘significant quantity of human remains’ at the site in Tuam during their excavations in 2016 and 2017, have also stated in their reports that the remains are in a ‘septic tank’. Those are the facts and terminology used by a team of experts who excavated the site in Tuam. During the launch, I chatted with Labour Party leader, Brendan Howlin. He told me he was very honoured to be there, and suggested the exhibition really captured what he called ‘the horror of the Tuam Babies’ scandal. He said the personal testimonies of so many speakers highlighted ‘how many parallel issues from Ireland’s recent past need to be dealt with properly’. Alison O’Reilly says Ireland has improved dramatically for children since the days of the Tuam Home, but she sounds a note of caution. As a natural mother, an adoptive mother, and a foster mother, she says she has a unique insight into both the state of the foster care system today and into living with children who are taken into care. She claims the State is abusing the in-camera rule ‘every single day’ and prohibiting media from reporting a foster care system she says is ‘severely broken’. Philip Boucher-Hayes says artistic interpretations of what happened to the Tuam Babies are welcome: “We know what our surface level feelings are about what happened to those 796 infants and children. Mute incomprehension at the indignity of their disposal and anger towards the society that was complicit in hiding them out of sight. But how do we really feel about them several layers deeper? Do we only pity them? Do we want to commemorate and move on? Or do we want to examine how we really feel about making the sacrifices that are involved in looking after those who can’t help themselves? The exhibition Stay With Me assembles some powerful works of art honouring the Tuam Babies. Many of the pieces stay with the visitor long after the visit. Aiseiri, by Bonnie Kavanagh, features 796 tiny white hearts rising to heaven. Clare O’Hagan’s piece Los Innocentes, features a tiny pair of baby’s shoes, silken strings inscribed with the Tuam Babies’ names spilling like waterfalls from the eyelets. Downstairs, a parade of tiny clay shoes winds past a suitcase containing the poetry of my friend Sheila O’Byrne, herself a Mother and Baby Home survivor. The Chalice of the Defenseless Children, by Martine Sterck. With Stay With Me, Alison O’Reilly has once again done right by the Tuam Babies. Stay With Me is in the In-Spire Galerie, 56 Lower Gardiner Street, Dublin 1, until January 30. Open every day, 12 noon until 5pm. Admission is free. “The exhibition brings up so many emotions and as a woman every piece resonated with me. I took so much comfort from the pure loving way each piece expressed the truth. “The truth hurts but when you compare it to the ways everybody has been duped and has to endure cover up after cover up only to have their pain stretched out into a never ending wilderness.